Jazz is a type of music which was invented in the United States. Jazz music combines African-American music with European music. Jazz first became popular in the 1910s. It is still a popular music to play and hear because of the different styles.
. In jazz fusion of the 1970s, electric bass, electric piano and synthesizer were common. Some common jazz instruments include the saxophone, trumpet, piano, double bass, and drums. It is difficult to give an exact definition for "jazz". One important part of jazz is improvisation (improv), which means the person playing is making music up as they go along. If a jazz band is playing a song, the song may have several solos where one player will improvise while the rest of the band, except for the rhythm section (such as the piano, bass, or drums), does not play. 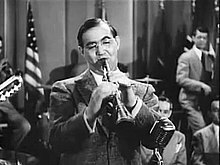 Benny Goodman, one of the first swing big band leaders to become widely popular. Jazz began in the United States in the early 20th century. Jazz music was first based on the music of African slaves who were forced to work in the plantations of the southern United States. This included call and response songs, spirituals, chants and blue notes. These characteristics are what developed blues, a sad song that slaves sung during their labor. These influences were indirect, through earlier musical forms such as ragtime. Jazz also has musical styles from European music, as well as the brass and stringed instruments and (sometimes) the use of musical notation. There have been different types of jazz through time. New Orleans jazz began in the early 1910s. Dixieland jazz was also popular. In the 1930s, there was swing jazz, which was also called big band jazz. In the 1940s, bebop became a major type of jazz, with fast songs and complex harmony. 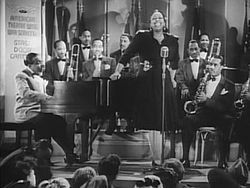 Large jazz bands, which are called big bands, were also popular in the 1940s. Big bands usually have 5 saxophone players, 4 or 5 trumpet players, 4 trombone players, a piano player or guitar player, an acoustic bass player, a drummer, and sometimes a singer. In the 1950s, there was hard bop jazz. In the 1960s, there was modern jazz and free jazz. In the 1970s, jazz fusion began to blend jazz music with rock music. Some jazz is still played with the same improv methods as it did at its beginning, except with modern electronic instruments. ↑ Larson, Thomas (2002). The History and Tradition of Jazz. Kendall Hunt.